When in use, outdoor clear blinds create the appearance of another room onto your house, especially when used in conjunction with an outdoor heater for winter warmth. When not in use, blinds can be rolled-up until needed again, making them an ideal versatile solution. Plastic patio blinds allow you to enjoy the views of the outdoors while staying protected from the elements. Cafes with alfresco dining areas or homes that love their outdoor entertaining can all benefit from plastic patio blinds. Clear Tinted PVC Retractable Blinds are a perfect way to maximise the use of your Pergola, Veranda or Balcony while still maintaining your view. Clear blinds are perfect in preventing discomfort from wind and rain that can be a problem in all year round, so if you require outdoor PVC blinds for your Melbourne home or business, you know who to talk to: Coolabah Shades. Clear and Tinted blinds are manufactured from UV stabilised PVC. The blinds are operated using a Gearbox and Crank Handle. In some cases these blinds can be motorised with a wall switch or remote control operation. Give your outdoor living area the security and shelter of another room with PVC outdoor blinds. 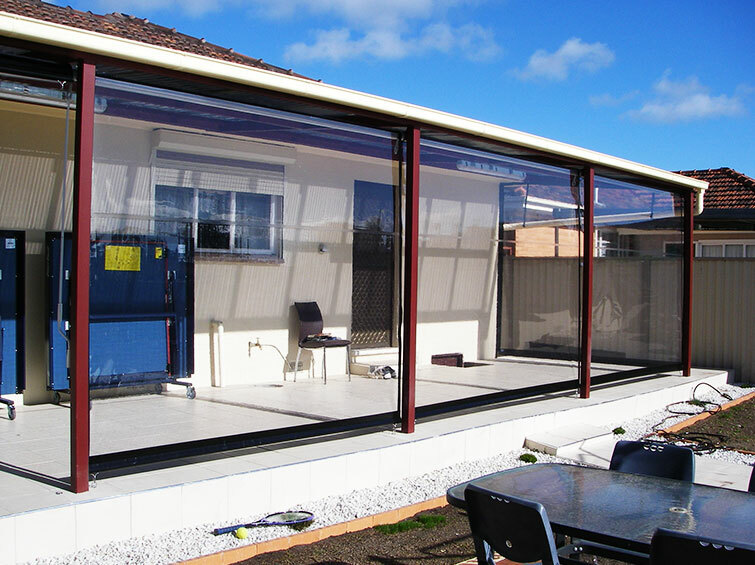 Whether you choose the crank-operated or motorised wall-unit, protecting your outdoor living area from the elements is only moments away. Whether you’re worried about wind, rain or harsh UV rays, our UV-stabilised and water-resistant PVC outdoor blinds are the ultimate first line of defence. Ideal for patios, outdoor decking or street side restaurant and café areas, the clear PVC outdoor blind is a low-impact, energy saving alternative to conventional outdoor heating. While offering the same, uninterrupted views as you’ve always had, the insulating PVC material retains heat. Essentially offering an impermanent and highly flexible way of turning your outside area into a protected, indoor living zone, the clear PVC outdoor blind is an affordable way to save energy and extend the use of your outdoor area into the colder months. Used in conjunction with outdoor heating appliances, you can even make use of your decking or patio for entertaining in the middle of winter. Contrary to popular myth and false advertising from alternative product manufacturers, Cafe blinds installed and operated correctly Do Not bang around in the wind, Cafe blinds when secured and tensioned correctly offer a large clear uninterrupted view (free from framework) of the outside and roll up discreetly when not required. Our PVC outdoor blind’s tinted option is a fantastic way to protect both your property and your skin from harsh UV rays during the warmer months. UV stabilized to be resistant to even the most direct sunlight, these tinted PVC outdoor blinds are a sound investment for any property as a means of reducing fading and wood-damage to outdoor furniture and panelling. While still offering clear, unobstructed outdoor views, you can enjoy the lifestyle of outdoor summer living with the peace of mind that you’re protect from sun damage. When it comes to outdoor PVC blinds in Melbourne, only enlist the help of the experts at Coolabah Shades.